I have written here before about how I really have to be inspired to post in order to post. Sometimes it feels as though the harder I look for inspiration, the more difficult it is to find. When I let go and stop trying so hard, inspiration generally strikes. I drew inspiration for these wee tartlets from a few places around the Internet. I hadn’t specifically planned on making them, but I’ve seen cherries used in various ways around the Internet recently, and everything just sort of came together in a perfect storm of cherry madness. 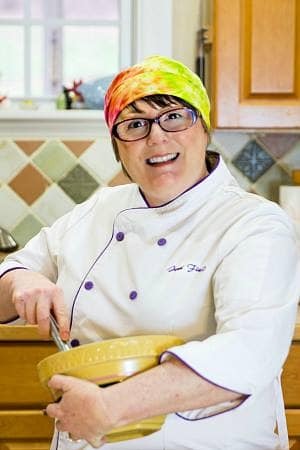 For those of you who are interested in how my brain works and in engaging in some gun slinger-ish baking, read on. My first inspiration came from owning a bottle of Vanilla Orange Balsamic Vinegar from The Olive Wagon. When I own something keen and sweet and tangy and interesting like that, somewhere in the back of my head, I am always figuring out ways to use it in new and different ways. Since it has lovely orange notes, a ton of sweetness and a bit of a tang, it just seems natural to keep pairing it with fruit. So I did. Photo by Isabelle Boucher. Used with permission. Click photo for Isabelle’s recipe. Add that idea to the inspiration that I got from Isabelle Boucher‘s post about the Balsamic Pickled Cherries that she brought to the Big Summer Potluck a couple of weeks ago, and I knew that I had the cherry part more or less down. Or at least a vague idea of it. Photo by Cheryl Bennett. Used with permission. Click photo for Cheryl’s recipe. Next up, these sweet and extremely cute Cherry Hand Pies that my wish-she-were-my-sister Cheryl of Pook’s Pantry made a few weeks ago. I mean, cute as a button, right? They even look like buttons! And who can resist flaky/tender/crisp crust with juicy cherries? Nobody, that’s who. Photo by Jamie Schler. Used with permission. Click photo for Jamie’s recipe. 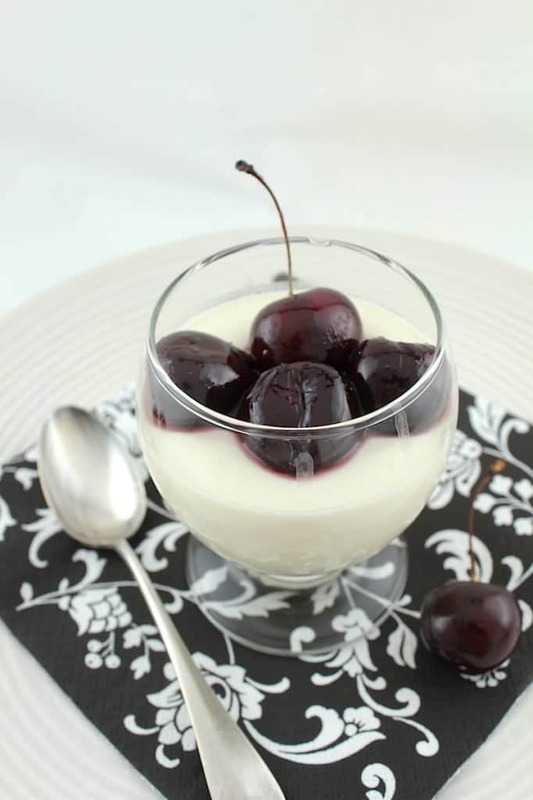 And as if all of that goodness wasn’t enough inspiration, along comes Jamie Schler from Life’s a Feast with her simply gorgeous, Vanilla Run Panna Cotta with Rum Roasted Cherries. I knew my cherry whatever-they-were-going-to-be guys needed a creamy component, too. And some alcohol to bring out those lovely alcohol-soluble flavors. We don’t keep much in the way of liquor in the house, and since I don’t like to shop and I had some vodka leftover from the orange lamb ragout, I used that. 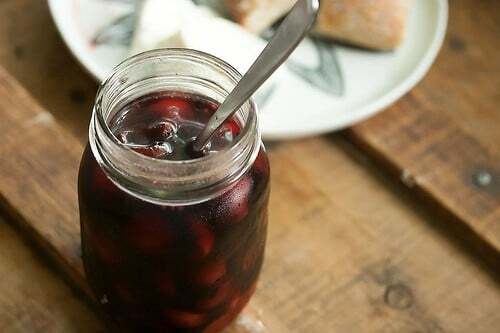 I already owned some cherries that I’d been using—putting in The Beloved’s lunchbox, making some cherry sauce and what not—for awhile, and I had probably what amounted to a cup or a cup and a half of them left. I rinsed and pitted them and put them in a pan with a healthy splash of vodka, a glug of the balsamic, a wee pinch of salt and about 1/4 teaspoon of vanilla paste. I waited until they were cooked to see if they needed sugar. They didn’t. The ratio you need to remember to make a lovely pie crust is 3:2:1. Three parts flour, two parts fat and one part liquid. Rather than scurry around searching for a recipe (0r even using one of the ones already posted here on the blog), I decided to wing it, weighing out 9 oz flour, 6 oz cold butter and 3 oz liquid. I used one ounce of vodka in place of one ounce of water because, while alcohol will make flour wet, it doesn’t activate gluten. Replacing a portion of water-type liquid with some alcohol will therefore give you a more tender crust. I also tossed in a bit of powdered sugar, some fine sea salt and a bit of mace, which is known for how well it gets along with cherries. I didn’t make panna cotta since I wanted to bake the whole deal together and a baked panna cotta is not a Thing. But I did want a creamy element and a visual contrast between the deep red of the cherries and the bright white filling–I had in my brain an image of Cherries in the Snow. I used softened cream cheese, sour cream, a pinch of salt, some powdered sugar and a very tiny bit of vanilla paste to make the cream. I considered adding egg for a more cheesecake-like flavor, but decided that there was enough going on without it, and besides, the egg would tint the cream yellow. And yellow snow is bad. The final product wasn’t as visually arresting as I’d wanted, but I didn’t mind too much because they were very delicious. For more contrast some other time, I’ll change the ratio of creamy filling to gorgeous cherries. My original idea was to pinch the dough up around the fillings like wee galettes, but that didn’t work. The dough would have needed support to hold its shape, and I didn’t give it any. Boo. …slumped. Muffin tin, to the rescue! My quick fix, after seeing the State of Things in the oven after 8 minutes of baking, was to spray a muffin tin with pan spray and sort of shimmy the wee tarts into the tins and continue baking. This actually worked out quite well, in a rustic sort of way, and I was pleased with the results. 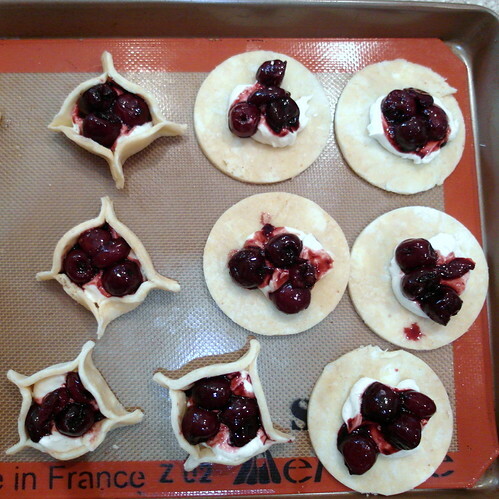 If you have individual tart shells, by all means use them, cutting your dough to fit your pans. If you’d like to make hand pies like Cheryl did, feel free to do that, too. You could also make one large tart, although you would have probably have to triple the amount of filling and double the cherries as well. Since I didn’t initially intend to bake these guys in tins, I didn’t egg wash and parbake the shells before filling, but I will write how to do that in the instructions, because I think it’s a better way to go if you want your crust to be nice and crisp, even on the bottoms. And now that you are all In the Know, here’s the official recipe. But you guys know that you can do your own thing, right? Good. Crisp, buttery crust, creamy just-sweet-enough cream cheese and luscious balsamic cherries, all in wee, poppable tartlet form. This recipe, as written, makes enough dough and filling for twelve 3 1/3" wee tartlets. Feel free to make this as one gigantic tart, though. That would be gorgeous! 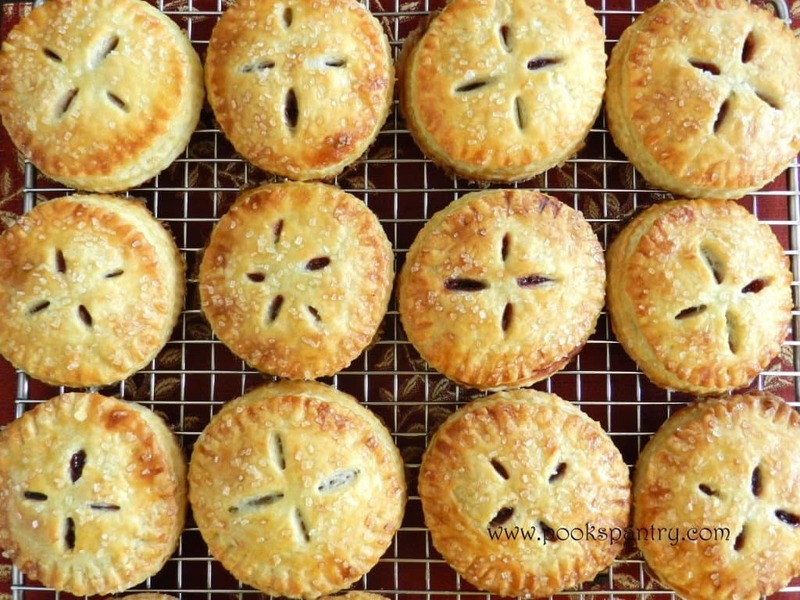 The amounts of dough and filling I am sharing are enough to make 12 small tarts. Scale your filling up or down to fit whatever molds you are using. If you want to make one 9" tart, I'd recommend tripling the cream filling and at least doubling if not tripling the cherries. 1 1/2 cups cherries, , washed and pitted. Leave them whole or not. Your choice. In a large, somewhat shallow bowl, whisk together the flour, sugar, salt and mace (if using). Toss in the cubes of butter and work them in with your fingertips until the flour is mealy and none of the butter chunks left are larger than peas. Mix together the water, vodka and vanilla. Make sure it is very, very cold. I usually put mine over ice, but just know that you might not need to use all of it. Drizzle half of the water mixture evenly over the flour. Toss well to combine. Drizzle in a bit more water, and toss to combine. Test the dough by squeezing a bit of it together. If it holds together even when you poke it with your finger, it's ready. If not, keep adding the water, just a bit at a time, and tossing in between, until the dough passes the squeeze test. Press the dough down into the bottom of the bowl in a disc. 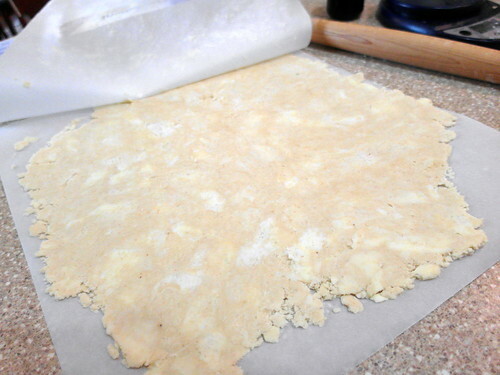 Place your disc of dough down onto the center of a piece of parchment and cover with another piece of parchment. Roll the dough out until it is about 3/16" thick. You might have to press the dough together a few times during the rolling process, and the edges of your dough may still be crumbly. Worry not; all will be well. Refrigerate the dough for about an hour or so. Bring to a boil and simmer until the cherries start to release their juices and thicken up somewhat, about 5-7 minutes. 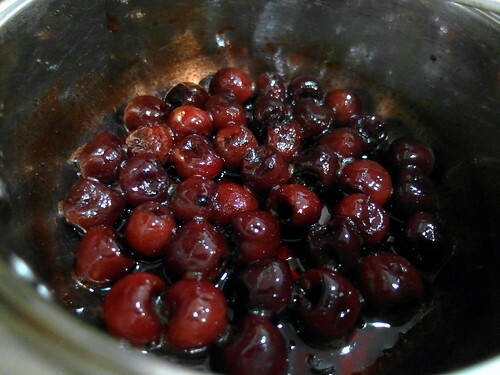 Don't stir too much, but keep the cherries moving by swirling the pan frequently. Taste. If you think your cherries need sugar, add just a bit. Set aside to cool to room temperature. In a small-ish bowl, whisk together all the ingredients until they are smooth. As long as your cream cheese is soft, this should be pretty easy to do. Taste and adjust seasonings, if necessary (it might need more sugar or salt for your taste). 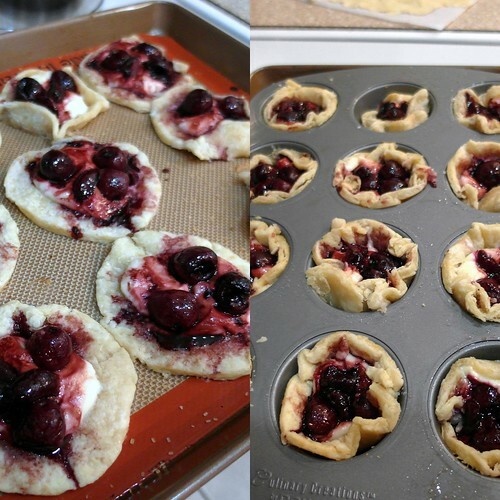 Remove the dough from the fridge and cut out circles to fill your small tart pans or muffin tins. The size of your circles will depend on the size of your tart pans/molds. Press the dough into the bottoms and up the sides of your pans, cutting off the excess dough with a knife, if necessary. Dock (poke wee holes in) the dough on the bottom and up the sides using the point of a small knife. Put your pan/s in the freezer for an hour. Take the pan/s out of the freezer and put them straight into the oven. Carefully remove the pans from the oven and brush the bottoms and up the sides (but mainly on the bottoms) with a thin layer of egg wash. If any of the shells are bubbling up, press them back into the pans. Evenly distribute the cream among the shells. Top the cream with a spoonful of the cherries and a bit of the thickened juices from the pan. Brush the edges of the tart shells with buttermilk, milk or cream and sprinkle about 1/2 teaspoon of demerara sugar over the tarts. Return to the oven until everything is nice and bubbly and the crust is a lovely deep golden brown, about 15-20 minutes. Remove from the oven and cool to warm for serving. I love the way you think Jenni. The thought process of conjuring up the recipe is every bit as fun as the end result. 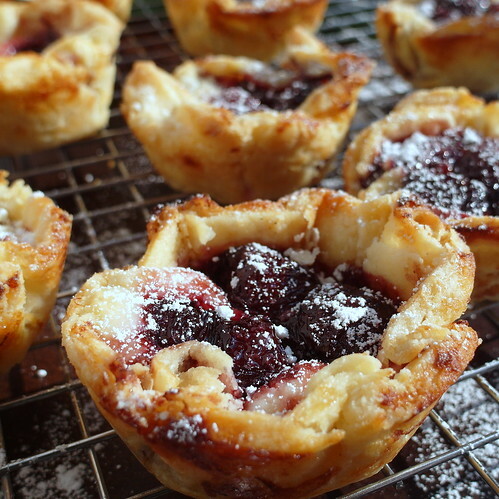 Three sources of inspiration resulting in terrific tartlets…YOU my friend, are an inspiration! I’m so hoping that folks will want to read the thought process and not just skip to the recipe–I think that’s where the real value is, not in learning “one recipe” but in finding the inspiration and making it work for you! It always makes me happy when you stop by, Brooks. Hope you guys are getting settled in your new digs and that all is well! I so want these! …and you’ve got me wanting a version with blueberries and lemon! Now *that’s* what I like to hear! Taking my idea and running with it–a blueberry lemon version would be fabulous! You could even bake the shells completely, fill them with lemon curd and then dollop them with stewed blueberries. or something. =) Have fun with it! Love the way you think, Jenni. I am often the same, when looking at ingredients and inspiration. Amazing things are sparked that way, in my opinion. 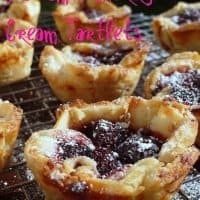 Your little tartlets are adorable, and I love the creamy inspiration you took from Jamie’s recipe (to die for). I have not bought cherries all season, and now I am inspired to run out and find some. PS…. the Mr. is a lucky guy. You pack him lunch? Bless you. I do pack his lunch most of the time, mostly because eating out every day is really expensive! Now, go find some cherries! I am so glad you shared your creation process. I love that you showed us how you are inspired and then take that inspiration to create something totally new. 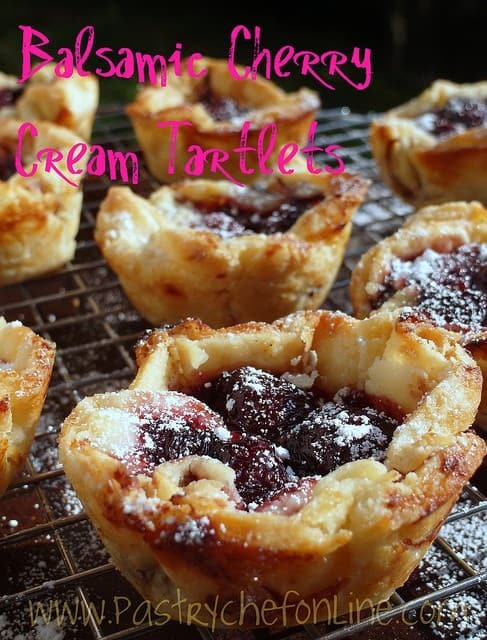 And I love the tartlets! I love the shape the muffin tins gave them which actually makes them even more tempting: I do want to grab one up and shove it in my mouth. Now I want to be inspired and make something myself, the same but different. Love these. Want to come over to taste. What a wonderful compliment, Ally! Thank you so much. And I have to tell you, these guys didn’t come together in my head until the balsamic happened. Wow!! 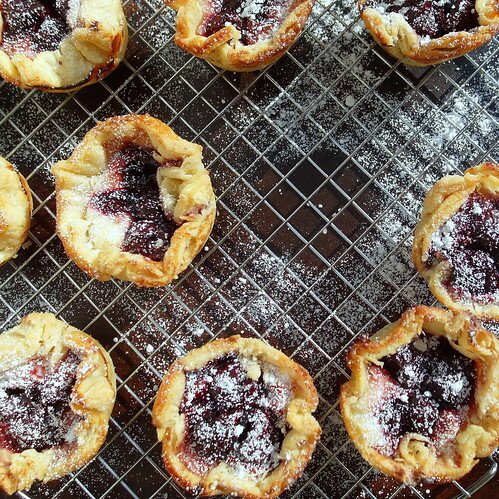 These tartlets are beautiful in a delicious sort of way. Balsamic and cherry were meant to be. This is inspiring me to bake a little something of my own and when I decide what it is, I just might write about it! When inspiration strikes it doesn’t mess around! Thank you for sharing your baking adventure. I truly admire your talent. Cherries, among other fruits, are not only delicious but proves to be very healthy as well. Check out http://www.somercotes.com/. I LOVE how your mind works and you could not have found better people to turn to for inspiration than Isabelle, Cheryl and Jamie. This is a keeper recipe, for SURE!